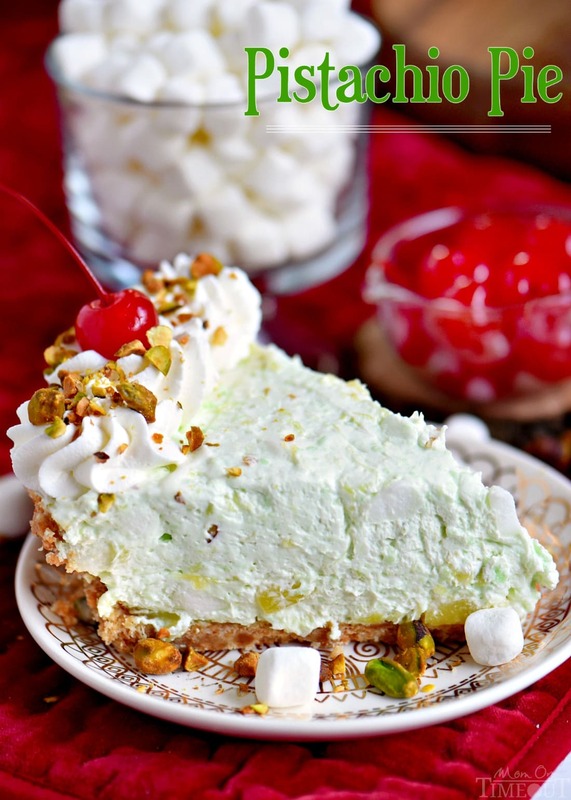 This easy Pistachio Pie recipe is a going to be hit with friends and family this holiday season! 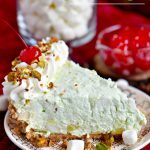 Extra creamy and completely irresistible, this no bake pistachio pie recipe takes just minutes to prepare! Make sure to add it to your menu this year! I can hardly believe that Thanksgiving is over and Christmas is on it’s way… This year has just flown by! Not that I’m complaining. I love this time of year and I’m already planning the most wonderful holiday season evah for my family – starting this past week with a trip to Disneyland! It was a little crazy going to Disneyland during one of the busiest weeks of the year, buuuut Reece is in 6th grade now and I would feel really guilty pulling him out of school to take him on vacation. So we braved the crowds, ate Thanksgiving dinner at Goofy’s kitchen, and wore tank tops for a week. It was 92F on Thanksgiving day. Yikes! I’ve been slowly sneaking in Christmas decorations for the past few weeks hoping Chris wouldn’t notice. He has a strict “no Christmas until after Thanksgiving” policy that I do my best to abide by – most of the time 🙂 Now that Thanksgiving is over, I’m ALL IN. It’s unbelievably delicious – as in my kids were basically drooling over their piece when it came time to taste test. Plus? It’s got the added bonus of being green 🙂 I added the maraschino cherries on top for a punch of color and love how it looks. Perfect for Christmas AND summer. Winning! 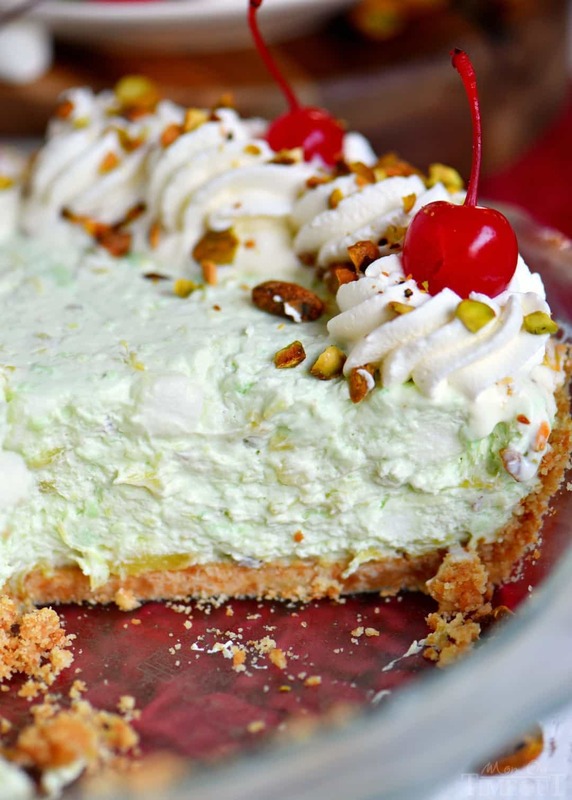 So here’s what I did… I took my Pistachio Fluff recipe (aka Watergate Salad) and turned it into a pie. (Lots of pie recipes here!) I added some cream cheese to the mix to give the pie structure because one of my pet peeves is pies that leave a hot mess when you cut out a slice. Makes me shudder just thinking about it. The cream cheese adds a delightful creaminess to the pie that really takes it over the top. The filling is no bake, of course (y’all know how much I love my no bake goodies), and I used my Nilla Wafer Pie Crust which can be baked or no bake, up to you. A store bought graham cracker crust would also be delish. 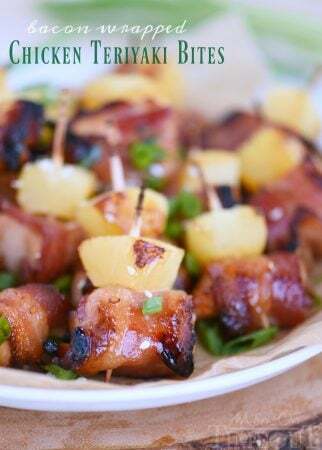 I used a whole can of Dole Crushed Pineapple – the full 20 ounces INCLUDING the juice! It adds a ton of natural sweetness to the pie that you’re going to love! 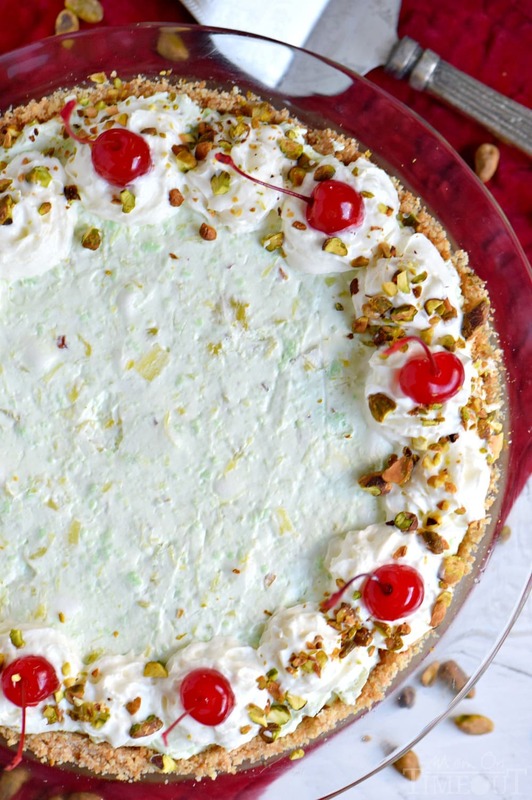 This easy Pistachio Pie recipe is a going to be hit with friends and family this holiday season! 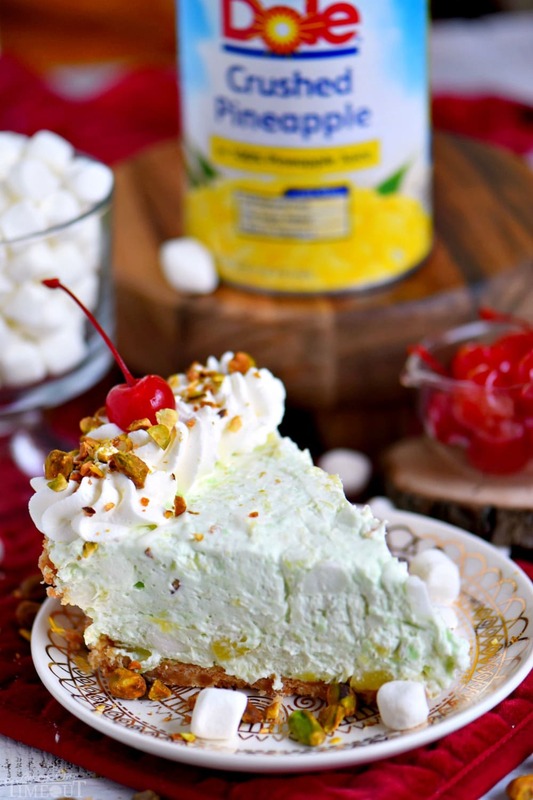 Extra creamy and completely irresisitble, this no bake pie recipe takes just minutes to prepare! Make sure to add it to your menu this year! In a large bowl, beat the cream cheese and pudding mix together until light and fluffy. 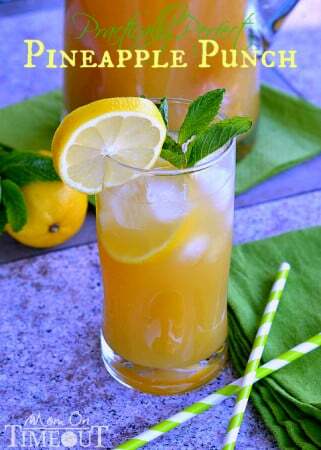 Beat in crushed pineapple including juice. Fold in Cool Whip or whipped cream. Spoon filling into cooled pie crust and chill for at least two hours. Beat whipped cream and powdered sugar together until stiff peaks form. Pipe on to the top of the pie. Add maraschino cherries and sprinkle with chopped pistachios. This is enough filling for a 9.5 inch pie plate. Extras can be enjoyed as a dessert salad. Disclosure: Dole has provided me with the products used within this project. I was compensated for this blog post. Thank you for supporting the brands that make Mom On Timeout possible! Looks amazing! This is my Christmas dessert! Just wondering how you think this would hold up if I made it a day ahead of time (or two…). Do you think it would loose its yummy fluffiness? My kids are not pineapple fans – what should I use in place of the crushed pineapple? LOVE that you guys got to spend Thanksgiving in Disneyland, that is so fun!! This pie looks serioulsy amazing, I love the green!! YUM! 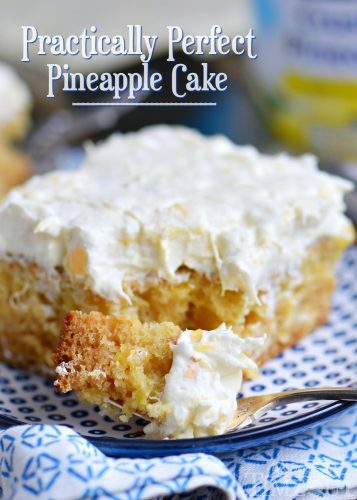 I love pineapple in desserts year round too! This looks perfect! Must ask as I didn’t read it in your recioe. DID you mix pudding dry with the creamost cheese or did you make pudding as box directions and then mix with cream cheese? I will be using SF pudding and SF cool whip for a diabetic friendly version. Hi Joy! I used dry pudding mix. There is a video right above the recipe if you have further questions. Hope that helps! 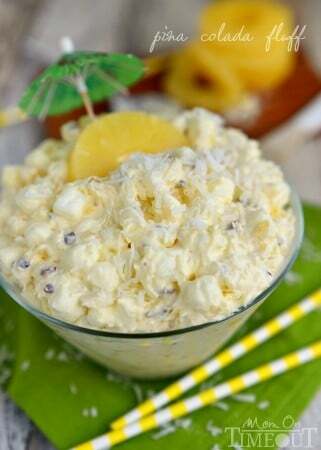 What a great use of their crushed pineapple – I always have that in the house for dips, quesadillas, and sliders. Totally love this pie! Great for Christmas, but also Easter! We keep it on hand all the time too Amy – so versatile! 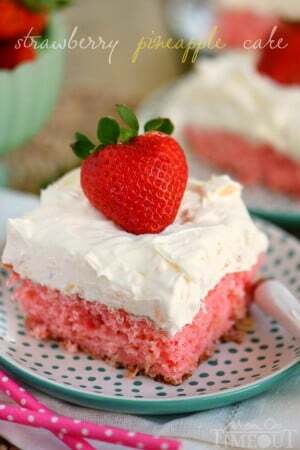 I think I just found my Christmas dessert! This looks so easy and I know my family would LOVE it! First of all, I am so jealous of your Disney trip, I’ll take 92 degrees!! Second, you have your menus aleady?? You are inspiring. I do not have my menus, but I think this pie has to be part of Christmas! Amazing! This looks delicious! I could almost taste the pineapple when you talked about it with all the juice and everything. Mmmm!!!! This looks amazing! I know so many people in my family who would love it!